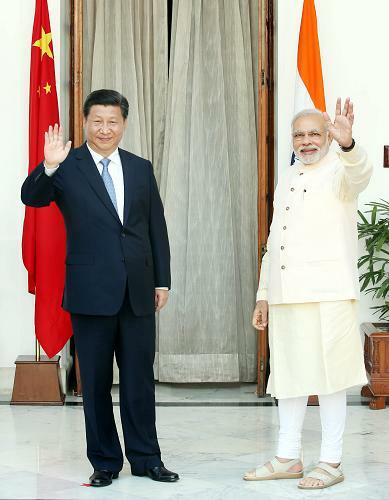 Visiting Chinese President Xi Jinping met Thursday here with his Indian counterpart Pranab Mukherjee, pledging to deepen cooperation and build strategic trust between the two Asian giants. Xi, who arrived in India Wednesday for a state visit, said that China and India, both emerging economies, are vital forces in the increasingly multi-polar world. Developing relations between the two countries not only concerns bilateral relations, but is also of strategic importance to Asia and the world, he said. Xi noted the two countries need to deepen strategic trust, enhance pragmatic cooperation and promote friendship between the two peoples, while properly managing their differences, so that the relationship can be developed healthily along a right track. Mukherjee highlighted the outcome of the day's meeting between Xi and Prime Minister Narendra Modi, especially the cooperation agreements signed by the two sides. Mukherjee said the Indian side is willing to deepen cooperation with China, respect the interests and concerns of one another, and appropriately resolve the undecided issues. The Indian president said China's investment is welcome in India's information technology, manufacturing sectors as well as infrastructure such as railways, roads and harbors.